David Schroeder is the ideal counselor, coach and leadership guide for individuals, couples and organizations who seek a pathway through difficult and upsetting transitions. “When you are ready and willing, I am a guide who helps you discover the way from what you’ve been to what you can become. I understand how the toxic residue of unresolved trauma can affect your life transitions. I know the dark side of anger, fear and pain, and how to illuminate it in safety and trust. My first published book begins with a moving account of a mystical experience I had with Jesus. It was this experience that inspired me to write Just Be Love. Just Be Love explores the many aspects of love from our human understanding of this ideal. We also explore what Divine love looks and feels like from the spiritual perspective. I reflect on love that is familiar to us. I also take you to the hidden, mysterious and paradoxical aspects of where love is often not realized, yet present. 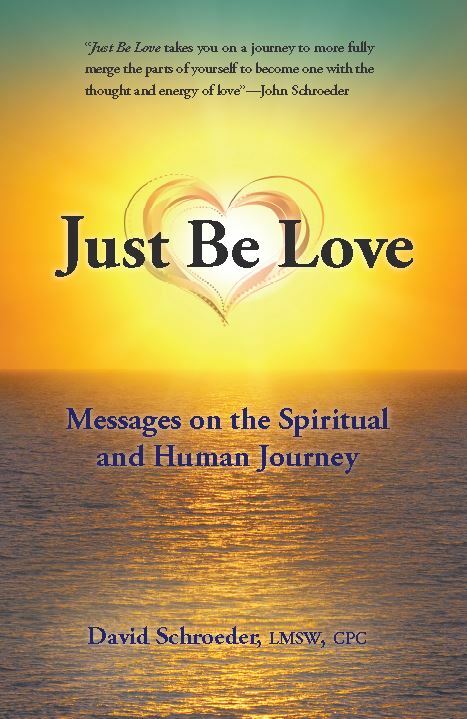 Just Be Love weaves my personal and professional experience, reflections and insights on love, as well the teachings and wisdom of the spiritual masters and poets of many traditions. This book guides you to contemplate and explore again and again that our purpose and reason for being—is to Just Be Love. Just Be Love is available for purchase at: balboapress.com/Bookstore/Home, Amazon.com or Barnes & Noble.com. If you would like an autograph copy of my book, contact me by email: humor311@sbcglobal.